Navigon have announced the release of the US version of MobileNavigator for Android powered Smartphones. Navigon's PR material claims this is the "first on-board navigation app of a major navigation company to launch on the Android platform" which may come as a surprise to ALK and Sygic who have both had Android solutions available with US mapping for some time. MobileNavigator is however a feature rich solution. 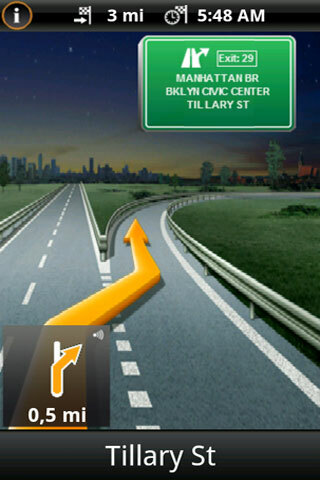 Unique features of MobileNavigator for Android include Reality Scanner, MyRoutes and Reality View Pro. Reality Scanner uses the on-board camera to provide a live augmented reality type view with POIs projected onto the image. Reality View Pro displays photo realistic 3D views of the highway with signs, lane markers and exits. MobileNavigator is compatible with 1.6, 2.0, 2.1 and 2.2 versions of Android. MobileNavigator USA is available in the Android Market now at a special launch price of $39.99. After the promotion ends the price will rise to $59.99. The price includes the Traffic Live service. For more information see www.navigon.com. The promotion price is twice the price of Copilot for the USA and the standard price is three times.